Introduction: The dentoskeletal morphology of Class II malocclusion has been analyzed in several cephalometric investigations. It is crucially important to understand the vertical components in orthodontic treatment. Defining the facial type of an individual is an essential key to obtain an accurate orthodontic diagnosis. 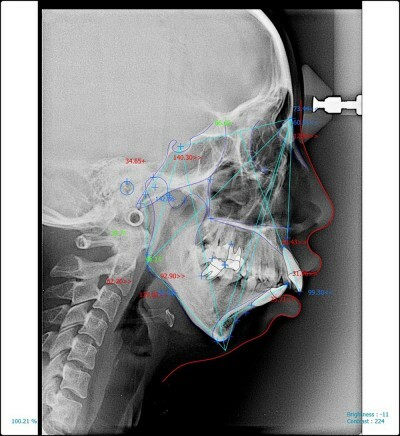 Aim: The aim of this study was to understand the correlation of vertical components in Class II skeletal malocclusion. Materials and methods: This is a observational descriptive study. This study used lateral cephalograms of Class II skeletal malocclusion from Universitas Airlangga Dental Hospital, between April 2015 and 2016. Cephalometric analysis was performed using digital software by a single examiner. This analysis measured gonial (Go), upper gonial (Go1), lower gonial (Go2), Yaxis-SN angle, the length of anterior face height, and posterior face height. The correlation between each variable was analyzed using the Pearson correlation test (P<0.01). Results: There was a correlation between vertical components and Class II skeletal malocclusion. Conclusion: Vertical components were correlated with Class II skeletal malocclusion. The greater ANB angle will be followed by greater Go2, which worsens the condition of Class II skeletal malocclusion.